Energic Motobineuse Type 75/100 CL right view. 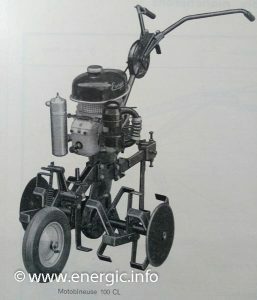 Same as Energic Motobineuse Type 100 CLI, but with the groupe 100 engine/moteur vertical not at a incline and different fuel tank arrangement. Engine. ILO Single cylinder 98 cm3, 4cv, 2 stroke. 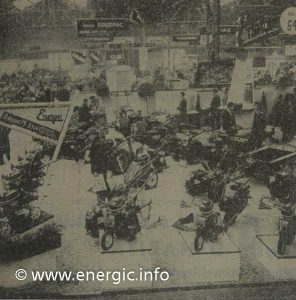 Read more about ILO engines/moteurs here. Fuel consumption. 1 liters of fuel per hour dependent upon working conditions. The tank holds approx. 2.5 liters. Adaptions. For hoeing/binage 5 sizes available from 22 cms to 100 cms, for /buttage 13 to 36cms. 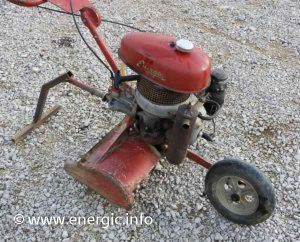 Grass cutter, plow/buttoir, hitch remorque, etc.